Yes, once again it is time for another Mixology Monday. This round is hosted by Jeffrey Morgenthaler, and the topic, one of the grandest reasons for celebration of all, Repeal Day! I’ll just put this out there. If lips that touch liquor shall never touch hers, well I’ll be making out with a Manhattan all day long. Those poor bottles didn’t deserve such a horrid fate, but I’d put dollars to donuts a few of those bottles mysteriously disappeared once the Temperance Worker’s back was turned. Prohibition came to Oregon in 1916, earlier than the rest of the United States… Before [Prohibition] was passed, Portland obtained approximately twenty-five percent of its general operating funds from liquor license fees, and the city proved unable to replace all of that money. The police department used its basement as a warehouse for confiscated liquor, and only destroyed as much as the public demanded. 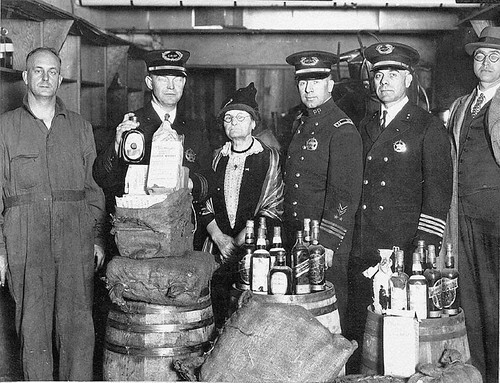 Vice squad members sometimes delivered cases of liquor to city hall, and most speakeasies paid corrupt police officers for protection and tip-offs before liquor-raids. When the prohibition amendment was passed and the Volstead Act was enacted, about three months after that I came through Portland, Oreg. Before that I had seen drunkenness there, dilapidated men, helpless, and in any condition that you do not want to see human beings. This time, three months after this act was passed there was an entire change. The men walked around from one place to another looking for employment, seamen and others. And they were sober. And I became an ardent advocate of the Volstead Act. Two years afterwards I came through,… and went to the very same place for the purpose of looking at the situation, and the condition was worse than it had been prior to the passage of the law. As long as the prohibition legislation was enforced, could be enforced, as long as the bootlegging element had not been organized, and not get the stuff, everything looked well. But the moment that they could get it they got it. And they will find it when nobody else can. They will find it somewhere. If it is to be bought in the vicinity any where they will find it. And the condition is worse than it ever was, because the stuff that they drink is worse than ever. A number of the bars that were acting as speakeasies during prohibition still stand and serve today. At Huber’s, you could get a Manhattan in a coffee cup, The Alibi (then known as Max Alibi, and far prior to its Tiki splendor) was quietly slinging drinks in the kitchen, and while the “Dry” saloons operated upstairs, the real barkeeps kept shop down below in the infamous Shanghai Tunnels. Of course, if you’re talking Tiki, one of the surest celebrators of Repeal Day must have been a gent named Ernest Raymond Beaumont Gantt, who more than likely financed his first bar, Don’s Beachcomber, through bootlegging rum. No polynesian pop-culture tiki bars had yet opened before prohibition, but Repeal Day surely helped spark the fire. During Prohibition, Cuba became America’s Saloon, and American tourists to the island brought back tales of Rum and Lime concoctions served at La Floridita. Thank goodness those days are over, and the booze now flows through the streets and alleys free and at will, ready for taxation and libation. But now that we’re free to do so, what to drink? Well, not being one to be entirely thrilled by names, but altogether fascinated by the branding, a quick peek into Vintage Sprits and Forgotten Cocktails brings about the Monkey Gland. This comes to us from Harry’s New York Bar, in Paris, which at the time was a great getaway for those career bartenders driven out of the U.S. during prohibition. Named for a surgical procedure dreamed up by a Russian Doctor (of which there is plenty of information here), which became known via popular songs, and your regular circular file news in the 1920s. Shake with ice and strain into cocktail glass. Garnish with whatever you can find that would be reminiscent of a monkey gland; a true Maraschino cherry does quite nicely. This drink is at first a tinge difficult, with the Absinthe and Gin fighting for dominance. Give it a few minutes though, and it becomes a lovely symphony, altogether not too sweet, not too herbal, but a nice combination of the mellow citrus, sweet Grenadine, herbal Absinthe, and gruff Dry Gin. Craig and I will be warming seats at TearDrop Lounge this Wednesday, December 5th. There’ll be Prohibition-Era cocktails, gangster films, and a wee bit of trivia. The prohibition drinks will be $5 for those with the password…. moonshine. Turning through the pages of .